This guide will help you begin your research on Environmental Inequality. Once you narrow down your specific topic, you will likely want to use other search terms that relate to your specific topic. For example, if you want to research environmental inequality related to safe housing, in addition to the suggested search terms above, you would want to brainstorm some search terms related to "safe housing." Using an * will allow you to search words with multiple endings. For example, polic* will search policy and policies. Using "and" will return results that contain both search terms. For example, searching "environmental justice" AND "pollution" will return only results that contain both environmental justice AND pollution. Using "or" will return results that contain either search term. For example, searching "environmental justice" OR "pollution" will return results that contain either environmental justice OR pollution. This may return more results than searching "environmental justice" AND "pollution," but the results may be less relevant. Using "not" will return results that do not contain that search term. For example, searching "environmental justice" NOT "pollution" will return only results on environmental justice that do not also contain pollution. This helps you eliminate irrelevant resources, but will mean you get fewer results. We also have e-book and print collections you may find useful! Search our catalog, or come in to the library and browse. If you find a print book that seems useful, consider browsing the shelf near the book for other books related to your topic. 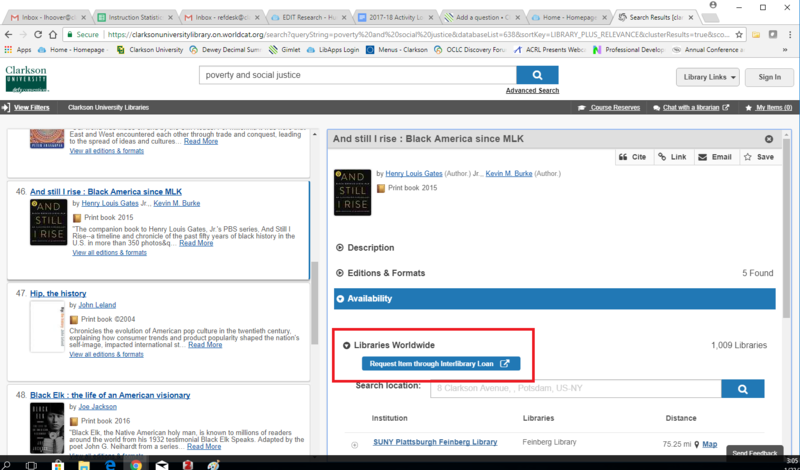 Or, if you are just starting out, consider browsing areas of the book collection that may be related to your topic. Here is a helpful guide to how subjects are arranged in the Dewey Decimal system. Don't forget, there is a lot of government information now available on the web. Our Government Documents guide has links to some useful places to find government information from laws to statistics.